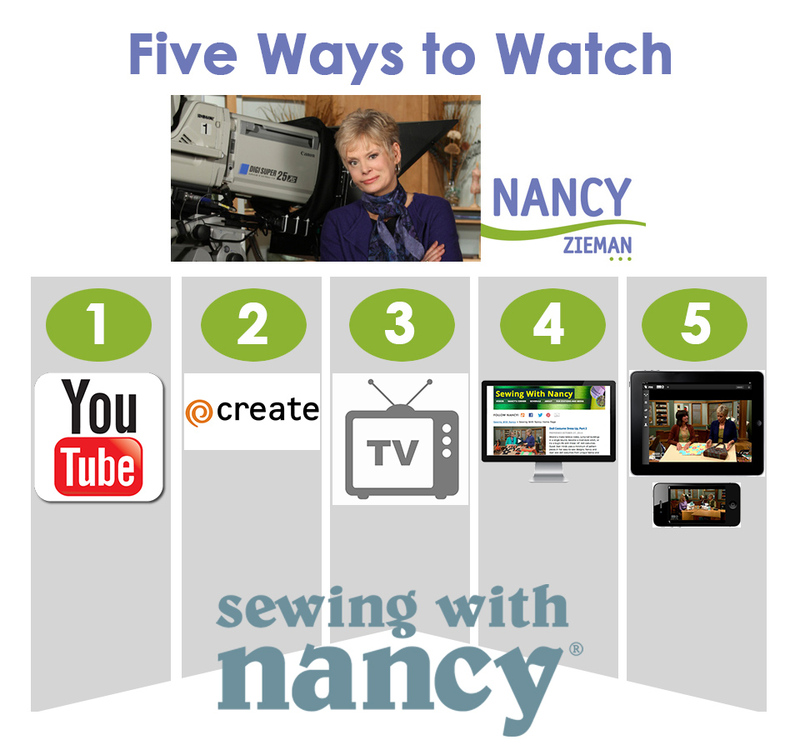 Did you know there are Five Ways to Watch Sewing With Nancy? Back in 1982 when the first Sewing With Nancy show aired, never did Nancy Zieman dream; #1, that she would record over 35 years of television, and #2 that the show would be available on multiple channels and across the internet. (Not to mention that in 1982 we hadn’t a clue about the internet!) Here are the five options for learning about sewing, quilting, and embroidering at your convenience. Watch full episodes of Sewing with Nancy on the official Sewing With Nancy YouTube Channel. The 2800 series of Sewing With Nancy is available to watch now. Additional full episodes will be added. Subscribe to the Sewing With Nancy YouTube Channel to receive notifications when programs are added. The Best of Sewing With Nancy, TV’s longest-running sewing program, continues the tradition of bringing the best of contemporary sewing, quilting, and embroidering ideas to public television viewers. Watch on a PBS Station near you. 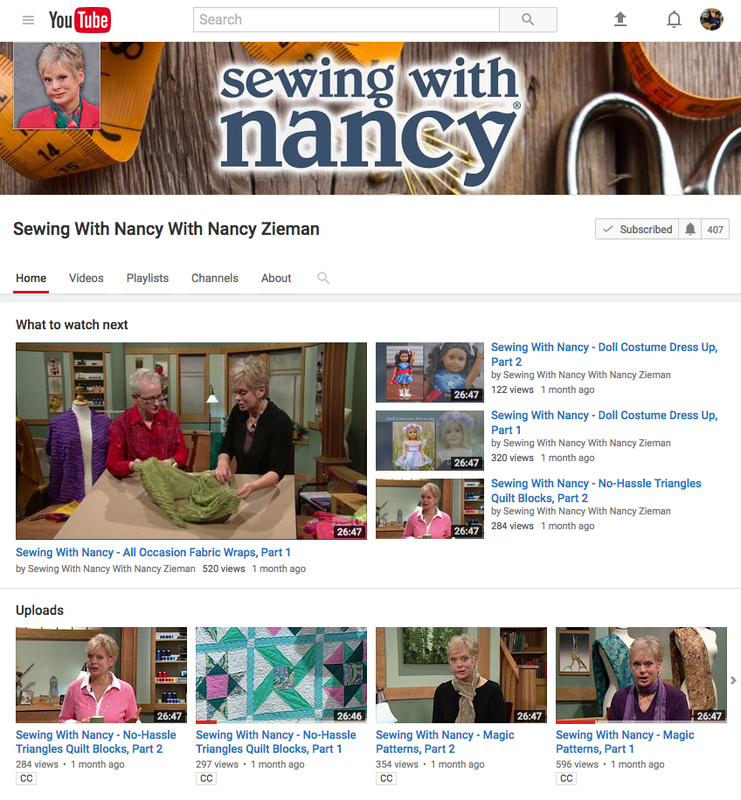 You can easily watch The Best of Sewing With Nancy online with your computer, laptop, tablet, or mobile device. Simply go to nancyzieman.com and watch full seasons or search for episodes. Nine seasons are available to binge-watch at your convenience! Did you know you can watch Sewing With Nancy on your mobile device? Use the PBS app, available for Apple iPhones, iPads, Xbox 360, Apple TV, Amazon Fire TV, and Roku! The app is free; all you need is an internet connection with Wi-Fi to watch the latest episodes. The videos have been specially built for the screen you’re watching on; we hope you think they look terrific. Download Apple’s iOS app. Please give it a whirl and let us know what you think! And, You Can Watch Your Favorite Sewing With Nancy Television Shows on DVD! Stay connected with all things Nancy Zieman by signing up to receive our E-News directly to your email inbox! Go to NancyZieman.com/blog/enews. After signing up, you’ll receive a blog posting each Tuesday, Thursday, and Saturday in your inbox. Learn Nancy Zieman’s favorite sewing and quilting tips and find out the newest in sewing and quilting tools and products. What’s your favorite way to watch Sewing With Nancy? Share your comment below for a chance to win a Supersize 5-in-1 Sliding Gauge from Clover Needlecraft. The randomly selected winner of a NEW! I Sew For Fun Clip ’n Glide Bodkin from Clover, from the April 6 blog post is, Shirley Clark. Her comment is: My little granddaughter, Shelby, has been asking to make some head bands. These are perfect! Her comment is: Beautiful quilt and fabrics. This is a project I would love to make. Hats off the talented makers! I have enjoyed watching Nancy on TV while sewing in my sewing room- a perfect afternoon! I watch every episode on my local PBS station and if I need a special technique I will go to You Tube and search for specific segments! I have learned so much over the years from watching her show! Have not seen Sewing with Nancy for a number of years now. The TV station has not put it on for years. I live in the Wasington, DC area. I miss it still. Call me old-fashioned, but I enjoy watching Sewing with Nancy on television where on a larger screen that I can see the details of the sewing. I have viewed YouTube videos as a means of access on demand. I like to watch Early on Sunday mornings before anyone else is up in the house. Watching then sets the tone for the rest of my day. It’s always a blessed day when I can watch Sewing With Nancy to start me day! I watch Nancy on my IPad, using the PBS app. I originally started watching Sewing with Nancy on TV. I watch Nancy on PBS – on TV or on my ipad. I use to watch on PBS no longer available in my area. Now I watch on line or shows I have recorded and saved thru the years. I have always watched Sewing With Nancy on my PBS station. When I retired I saw my first episode and have been watching every week since 2005! She was a wonderful teacher and amazing lady. I look up episodes thru the PBS app on my phone. If I want a larger picture, I watch Nancy on my iPad. It’s nice to always have a friend available to sew with! After all of these years watching Sewing with Nancy on PBS/Create channel – this show has been dropped from my local lineup. I used to rush thru housework so I could sit and watch this show. My very first quilt was “Rob Peter to Pay Paul” that Nancy featured approximately 15 years ago. My granddaughter says this quilt is what attracted her to sewing and quilting. FYI, not everyone has one of those dumb ‘smart’ phones! I have my DVR set to record Nancy anytime she is on. That’s my favorite way to watch (PBS) but I know that if my satellite is down and I don’t get the entire show, I can get it on WPT. I’ve been a big fan for years! Grew up watching her on PBS Channel, still my favorite way to watch it. I mostly watch on You Tube. She was the best teacher out there. I like to watch on my tablet because it enables me to watch at my convenience rather than trying to fit it into my schedule and I can take it right to my sewing table if needed. I used to watch Nancy’s show on tv but now I like to use my tablet. I watched sewing with Nancy on PBS years ago. Now I watch it on you tube. I enjoy all the sewing tips. My husband and I moved many times since 1982. I would find the PBS network and Sewing with Nancy would be on usually Saturday mornings at 8am. That is where I would be in front of the tv. I have always enjoyed watching and learning new techniques from Nancy in any venue that she appears on. I have watched many years of “Nancy” on PBS–what a talented and enjoyable lady!! I morphed from watching Nancy on my local PBS station to YouTube on my P.C. to getting NZP emails on my phone! When home I watch Sewing with Nancy while walking on my treadmill, headphones on and tablet propped in front of me. I’m so glad that the older TV shows are going to be made available. I had taped an episode of sculpting a teddy bear face . Since there was something else on the tape, I lent it out to a friend who taped over it. I was devastated. She shrugged her shoulders and said you shouldn’t have let me have it. Now, maybe I will be able to learn this skill. THANK YOU! 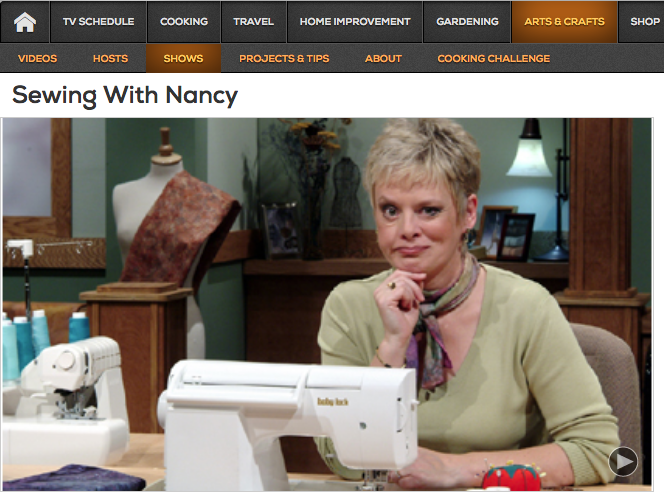 I absolutely love Sewing with Nancy on my PBS station. I started watching the show about twelve years ago when I started sewing. 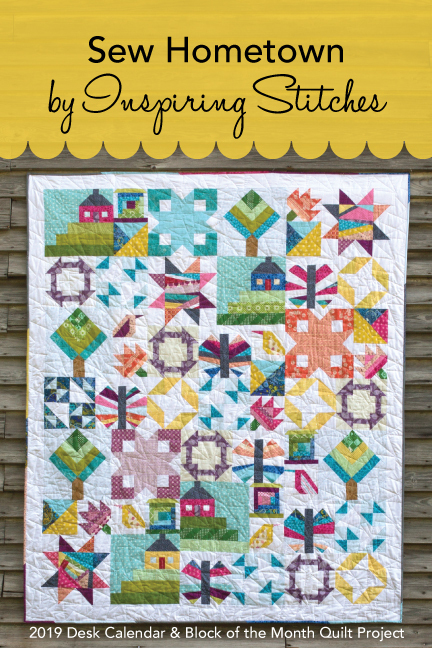 I became a quilted because of Nancy’s show and learned so much from her. Thank you for continuing the shows. I’ve been a fan since receiving my first Nancy’s Notions catalog back in the 80s. We were in the same age bracket and she was someone to whom I could relate. Those were wonderful years, and when Sewing With Nancy began – it was even better. My favorite way to see her show was, and still is, on my local PBS station (Detroit Public Television, WTVS Ch. 56), supplemented by the options of viewing on my laptop or my smart phone. I love sewing along with Nancy! I enjoy all the episodes of Sewing With Nancy and am grateful that PBS and Create TV continue to broadcast her programs. There was a reason she had the longest running how-to show on PBS …. she was the best!! Every Sunday morning, for years, I have been going to “church”. I get a cup of tea then put PBS on to listen and learn with Nancy Zieman! She makes my day. Thank-you for continuing with her program! I have watched Nancy for about thirty plus years and have learn so much from her and loved it all. I always DVD on PBS so I don’t miss anything even though I probably have seen it before. Can’t always watch the show on TV but DVR every show so I can watch them when I have time. Love all the shows and learn so much from them. I have taped years of Nancy. Mow that I have new machine I can sit and watch and pause and work. I look forward to watching Sewing with Nancy 6 days a week – usually at 9 am It is a great way to start my day. Nancy has always been so inspiring – I have been watching for over 30 years. I looove watching Sewing with Nancy any time or any place on my phone or tablet! Always enjoy watching her videos, I can watch the same tutorials many times and find so many things to learn and so much inspiration from Nancy, specially because I’m learning to sew and she had different projects for everybody. We never got the program on TV, so watched it later on the Wisconsin Public website. Watch her on TV. I can relax with a cup of tea and enjoy her show. If I miss an instruction, I can backup with the DVR and re-watch the miss. Love watching her on PBS. When I dvr it I can always go back for a measurement she gave, etc. And hearing her voice is so awsome. But I sure miss her. I love the ease of searching the topic I want to review on YouTube! Still perfecting my skills thanks to Nancy, a real friend by way of TV channel Create, YouTube and ownership of several DVDs. She is not here with us in person today but she will always be with us through the technology of “our days” – so SEW on fellow followers of OUR INSTRUCTOR – Nancy Z. On PBS or Youtube, but the best of all was when I saw her in person. So sad that that is no longer possible. I still like to watch Sewing with Nancy on my local PBS tv channel. I do sometimes check you tube videos as well. Glad to see so many options still available. I & a friend look at Nancy every Saturday Morning on LPD & PBS. My friend & I have been making baby blanks, Bags & cover-up for the homeless, out of old sheets and upholstery materials. we get ideals from Nancy show how to put things together. Also new things to make out of the material that is donated to us. I love to watch Nancy on YouTube. It is so convenient to be able to pick and choose the time that’s right for you, when you won’t have any interruptions. I watch Sewing With Nancy on YouTube now and can take my laptop into my sewing room with me. When I had young children, I taped her PBS shows on our VCR and would ‘binge’ watch them one evening a week while the kids were in bed and my husband was still at work. That was my ‘me time’. I watch on Youtube. So nice to be able to get an episode when you want or need to watch it. I had recorded about 45 of the PBS broadcasts of Sewing with Nancy and just kept them on the DVR in my sewing room. We recently upgraded our DVR system which meant that I had to give up all of those recorded episodes. I thought long and hard about that! Now I have a smart TV in my sewing room and can watch the episodes on YouTube and I am one happy girl. I watch Nancy’s shows on her website and YouTube. Years ago I used to watch the shows on PBS. I’m glad they are still available. Every week I have my. DVR set to record SewingWith Nancy so I can watch and re-watcheach episode. I watch Nancy on Create, PBS station, you tube and computer. It never hurts too re-watch the programs again. My favorite way to watch sewing with Nancy is on YouTube. I used to watch her on TV when I lived in Dallas TX over 20 years ago. I purchased many of her tapes (VHS back then) and books. I still watch her today in Clyde TX on PBS and have purchased DVD’S and books since being here. I loved her as she taught me so much! She’s greatly missed but will always be with us and for the I am profoundly grateful! I am in my early 70′s and probably have watched Nancy for 30 years, watching her grow to become the number one authority on sewing. She is my “go to” for sewing information. I watch on Wisconsin Public Tv station out of Madison,Wi. I watch on my local PBS channel. And I have a few of her books with cd’s. I used to watch on PBS when I had a TV, now I watch on computer. Quality of information is still high quality. I have enjoyed watching her shows on YouTube and her website, so glad her emails have been continued. Have learned a lot from her over the years. I have watched Nancy in PBS for as long as I can remember. I have also watched through the website and dvds from my computer. The mobile app is not available in my area but I will be checking out you tube and create tv. Thanks for the information. I truly enjoy watching Nancy’s shows and I’m glad they are still available. I watch Nancy on my local PBS station. I always look forward to the day her show airs. I watch Sewing With Nancy on many venues (PBS, Create, You Tube). I have been a fan for many years. Thank you for keeping her Legacy alive. I watch Sewing with Nancy on PBS tv, and look forward to the tri-weekly blogs. I have the smaller Clover seam gauge, and could really use the larger model! Favorite way to watch is on TV. Second choice is on the computer. My usual way to watch Nancy is TV. If i’m Doing a special project, I often look on You Tube to access the show I need. I love that I can access Sewing with Nancy so many ways. She was my first Sewing teacher and if I think “I saw that on Nancy” I can find it and watch it again. I watch Sewing with Nancy on the Create channel. After all these years, I still look forward to “my time with Nancy” when I sit down, relax, learn & enjoy her shows on our local PBS Station. Always a treat!! !